US Secretary of State Hillary Clinton said the US still had "profound concerns" over North Korea, but welcomed the move as a "first step". "On the occasion of Kim Jong-il's death, I said that it is our hope that the new leadership will choose to guide their nation onto the path of peace by living up to its obligations. "Today's announcement represents a modest first step in the right direction." The statement, carried by the KCNA news agency, said the measures were "aimed at building confidence for the improvement of relations" between the two countries, and said talks would continue. "Both the DPRK [North Korea] and the US affirmed that it is in mutual interest to ensure peace and stability on the Korean peninsula, improve the relations between the DPRK and the US, and push ahead with the denuclearisation through dialogue and negotiations," it said. In Washington, the feeling among officials and analysts is that this is a useful but limited step forward. Having inspectors on the ground in North Korea will, they believe, be very useful, but the optimism is coloured by a sense that promises like these have bloomed and withered many times in the past. 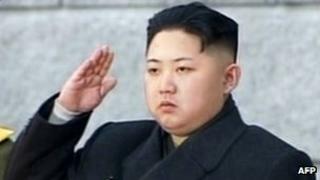 For Mr Obama, the agreement reduces the chances of a serious North Korean nuclear crisis during his re-election year. And what do the North Koreans get? They will receive shipments of "nutritional assistance" for a hungry population weeks before a politically important celebration - the anniversary of Kim Il-sung's birth. One crucial area not addressed, we're told: uranium enrichment facilities which may exist outside Yongbyon. US analysts remain worried that North Korea possesses as yet undiscovered centrifuges. In all, the agreement - if it sticks - may help the chances of a resumption of comprehensive denuclearisation talk. Yukiya Amano, director general of the UN International Atomic Energy Agency (IAEA), said the announcement was "an important step forward" and that inspectors stood ready to return to North Korea, Reuters reports. Earlier, a senior US military official said the issue of food aid for North Korea was now linked to political progress - contradicting earlier policy.